Christian Democrat politican Patrick Sensburg doesn't believe in electric, either. Germany's become so infuriated over NSA spying revelations that it recently demanded the removal of the CIA's top intelligence officer and Berlin station chief, and now the head of the Bundestag's inquiry into the NSA affair has said it's time to go one step further in its search for perfect security. Email cannot be trusted, but typewriters can, and the committee's determination to ensure the CIA doesn't get its hands on its deliberations before official release may lead it to buying old tech in bulk. 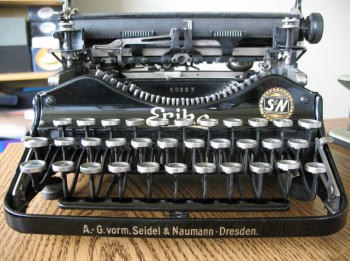 When asked in a television interview whether the committee was considering typewriters, its head, Christian Democrat politican Patrick Sensburg, replied, "As a matter of fact, we have - and not electronic models either." It's no joke; it may even be a sensible precaution given the circumstances, though it's to be hoped that someone remembers to burn the typewriter ribbon rather than throw it in the trash. The inquiry's paranoia is to be expected, given that new spying revelations are occurring every day. The latest spy scandal involves a BND double agent, originally suspected of spying for Russia. It turns out that the spy, known only as Markus R, actually met with CIA handlers, and was paid about $34,000 to provide over 218 documents to American intelligence. Sensburg is also keen to make sure his current means of communication aren't being interfered with. He wants all members of his committee to run security checks on their smartphones, and intends to do the same with his. "We have to try to keep our internal communication sure to send encrypted e-mails, use crypto phones and other things, and other things that I won't mention, of course," says Sensburg.